"Nos. 296-302 form yet another matching group, slightly different in height; all probably had triangular architraves at first-floor level. No. 300 was taken over in 1975 by an organisation called Caribbean Cultural International as a cultural centre specialising in the dissemination of information and literature of African history. 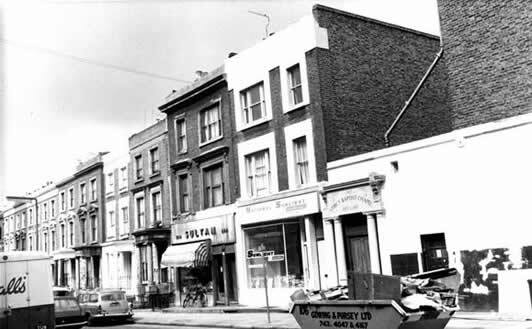 The building was named Karnak House (and still has a Nilotic design on its façade) and their operations included a small publishing house, Karnak House Publishers, specialising in books by African and Caribbean writers or on African and Caribbean themes." To paraphrase Frantz Fanon, every generation has to find and fulfill its mission or betray itself. This simple philosophical maxim carries a surreptitious weight and unfolds the significance of its meaning only by a cataclysmic transformation of consciousness. In the case of both Karnak House and Cheikh Anta Diop I would like to believe there are parallels and connections between the two. Karnak House was founded in 1975 in London as Caribbean Cultural International inspired by the work of Amiri Baraka who founded Spirit House and Jihad Publications in NewArk, New Jersey. It consisted of artists and writers and staged painting, photographic, ceramics and other visual exhibitions, and promoted poetry, fiction and intellectual seminars, lectures and conferences in order to raise the level of arts/literature awareness. It soon transcended its regional perspective and included work by Africans in any geographical location as well as progressive Europeans of any nationality, a model well preceded by Society of African Culture in Paris (1947). I have been going to Paris since 1968 and later developed a working relationship with many Caribbeans and Africans there. Présence Africaine was a focal point for all African-descended intellectuals in Paris and it was under the direction of Alioune Diop, the driving force of the journal and publications, that Cheikh Anta was first published. It was also through the organising umbrella of Society of African Culture/Présence Africaine that Cheikh Anta received his first international audience at the Black Writers & Artists Conference in Paris 1956. Diop’s thesis of the origin of civilisation and of Ancient Egypt as black assumed a status and a stage at the conference. His thesis was rejected by James Baldwin (1965: 45) who thought that “I cannot say that he convinced me,” but he conceded that Diop was a “great success... second only to Aimé Césaire.” It was African American James Spady who revived this scenario in his essay on Diop published in the Journal of African Civilizations in a special issue dedicated to Cheikh Anta. It can therefore be stated that the reception of Diop’s revolutionary ideas in the USA were mediated and tempered by Baldwin’s naive and antagonistic position. A strange phenomenon happened in the 1980s. But let me rehash a scenario in 1973. A black-owned Brooklyn-based record shop was importing Manu Dibango’s “Soul Makossa;” due to its increasing demand for supplies, a large independent conglomerate, Atlantic Records, stepped in and bought the US rights directly from the Paris-based record company. It became a massive hit. Haki Madhubiti’s publishing company had released Diop’s The Cultural Unity of Black Africa without a contract, but this paved the way for African American intellectuals to read for the first time in English Diop’s two-cradle theory, a phrase relentlessly propagated by Leonard Jeffries, erstwhile African-centred activist. Jeffries subsequently wrote a penetrating review of Diop, published in the Ivan Van Sertima edited, Journal of African Civilizations. More than any other essay, this paved the way for the investigation of Cheikh Anta as a profound alternative to the received tradition about African social systems. Subsequently, we at Karnak in 1989 licensed the translated book directly from Présence Africaine and commissioned an introduction by the nascent specialist in matriarchal systems, Nigerian-born Ifi Amadiume. Cheikh Anta Diop’s subsequent two books were published by Lawrence Hill & Co. Karnak House published a collection of essays entitled Towards the African Renaissance by Diop, dating from 1948 until near the end of his life. One important development that needs to be stated is the first international conference we at Karnak staged in 1985, The Afrikan Origin of Civilization, held in London and featuring Cheikh Anta as the primary speaker, along with Ivan Van Sertima, and Carlos Moore. We had an audience of 600 people, standing room only. It is the direct contact with Diop here that the arrangement was made via Dr Finch for Diop’s only engagements in the USA in which he was given the key to the city of Atlanta by Mayor Andrew Young, extensive audio and TV coverage and preliminary plans for a multi-state, multidisciplinary international team to work together to unlock and reveal the histories and civilisation of Ancient Africa. How important is Diop’s world view to the African world? Diop in Cultural Unity achieved a major breakthrough in separating the social and political development of the Indo-European world from Africa. His major thesis is that a matriarchal social system is more given to producing a holistic society as the mother represents nurturing, love, family cohesiveness and an ethics of compassion. On the other hand, patriarchy produces separation of the sexes, war, violence, the reproduction of the family unit above filial attachment to the state. In African Origins of Civilization, apart from the deconstruction of anthropological disinformation propagated by the dominant European view, he also states that Ancient Egypt did not produce slavery and in Cultural Unity he asserts that there was no revolution in Africa prior to European dominance. It will be understood that there has never been, in Africa, a revolution against a regime, but only against those who administered it badly, that is to say, unworthy princes (CU p. 167). This statement appears tautological as the period of Kmt’s existence is characterised by kingdom polities. The prince functions for and on behalf of the nsw/king. Thus oppressive behaviour of a prince would appear to be state sanctioned as he is a functionary of the divine kingdom. When a minister acts badly in government it is seen as the government is acting badly. The usual consequence would be to dismiss the recalcitrant. There is enough evidence, therefore, to prove that in Kmt itself regimes sometimes changed due to maladministration, and it was not just the prince but the social system itself. Kmt’s predynastic history began, like many locations in Africa, as a multi-king/chief polity. Scorpion carried out acts of war in collectivising the state which was completed under Narmer c. 3150 BCE. There was no chattel slavery in Africa but there are documents in Kmt which show that a master could transmit a servant by way of inheritance to members of his family. Conversely, it also demonstrated that the servant could marry his/her master’s son or daughter. Indigenous African systems also had enservitude peoples usually captives who could be sold or who would remain in that position for life. But it was not chattel slavery as there are many instances, like that of Jaja of Opobo, who rose to be King having been captured into slavery during the period of European slave hunting. There is definitely a stigma attached to those who emerged from this heritage despite success. In Diop’s philosophical worldview he projects the idea of vitalism, a theory advanced by Placide Tempels, a priest. Vitalism is the recognition of like forces in the animal kingdom: the lion, the hawk, the diob bird, the leopard, etc. All are adopted due to scientific study of their qualities: the lion, for example, is regarded as the king of beasts and the male can weigh from 160 to 230 kilos and is a carnivore, attacking and killing other animals for food. Lions hunt collectively, ‘[while several hide, others circle the prey and chase it toward the waiting lions that are crouched in the grass...’ (Encyclopedia 1992: 303). Members of the pride eat collectively but fight over the largest portion. Lions establish territoriality over which they squirt their urine to identify dominance and forcibly deal with other animals who dare to hunt in their terrain. The male lion has to fight to establish his dominance over a pride and when he succeeds by killing the dominant male, he sometimes kills the defeated male’s cubs as an act of demonstrating dominance and possession. On the other hand, life within the pride is usually peaceful and the lion is considered the most companionable of cats in that it forages and hunts collectively. These ideas, when transferred to the nsw/king, become central to an understanding of African philosophy. The method of philosophising moves from the concrete, as Obenga would say, the Real, from which lessons are transmitted. Thus the accusation by some European egyptologists that the Kemites were incapable of abstract thought is based on a limited understanding and definitely a bias to awarding Europe the prize of basin of abstract thought. I will give one example of “abstract thought.” There is the famous tree, the sycamore, in which is represented Isata/Isis upon whom her breast is sucked by the nsw. What does this mean? Does it literally translate that the king is sucking a tree or the breast of the long dead Isata if she ever lived as a person? It represents the veneration of an ascended woman, Isata, who represents all the qualities defined by Diop and from this symbolic interpretation can be made that the king is being nurtured and authenticated by this prodigious mother figure. A publisher colleague, Roger Zwanenberg (of Pluto Press), sent a collection of poetry to Karnak House with a short note: “Saba, here’s a collection of poetry. I cannot make head or tail or it. What do you think?” After reading the first poem, the publisher felt this needed to be published. The book was published in 1983 and entered for the Commonwealth Poetry Prize and won. On the jury was Alister Niven, a former director of the Arts Council, who felt the winner would emerge from either a Canadian or a Guyanese. Dr Niven was convinced that the author of I is a long memoried woman, Grace Nichols, should be given the award, especially since no female had won it. The jurors agreed. Karnak aggresseively promoted the book and it became a springboard for turning the author’s life into a full-fledged writer. It was made into a Channel 4 TV film, placed in the National Sound Archives and has been anthologised around the world in many anthologies, from Africa, the Americas, and Europe, as well as the subject for many post-graduate studies all over the globe. Soon Come. More to follow.